June 22, 2018. 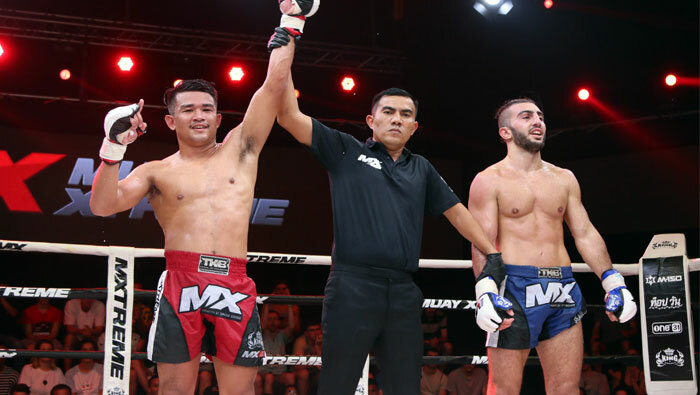 Rawai Muay Thai fighter Madsing is participating in this year’s MX Muay Xtreme Tournament in Bangkok. He has moved up a weight class in order to take part. He normally fights at 62 Kg but for this event, he weighed in at 67 Kg. He fought against Ghokan Boran, a boxer from Turkey, who trained at Tiger Muay Thai for this event. The fight was 3 rounds and Madsing won by decision. For Madsing it was the first time fighting with MMA gloves. These gloves are smaller and lighter than normal Muay Thai or Western boxing gloves. And you feel the impact more. This was evident in the first round when he almost lost due to a hard punch to the head. He went down and later told us he ‘saw stars’, but managed to get back up in time and regain his footing. He was stronger in the second round, focusing on kicking more. Finally in the last round he kicked non-stop to take the fight. He moves on to the semifinals.